A brilliant innovation in belt tightening/loosening technology and a very classy look. So good that I wear them with jeans or dress trousers. 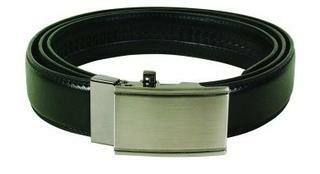 Men's black leather belt with unusual infinitely-adjustable rack locking system in place of pin and holes. Allows quick adjustment during the day to an infinitely variable degree. No longer constrained by the fixed position of the belt holes. Very smart look with either a silver buckle plate or a black one.